Ri'Bassa is a Khajiit warlock and the respected Shaman of Border Watch. He shares his house with Zabhila and plays a key part in Sheogorath's Shrine Quest. He truly believes in his great-great-great grandfather K'Sharra's premonitions, but will take it relatively easy in everyday life: after waking up at 4am, he wanders around town all day long, pausing only to eat lunch and dinner. He will consume his meals at the Border Watch Inn for two hours, starting at 11am and 7pm. At 10pm, he returns to his house to sleep. During the related quest, there are two exceptions to this routine: after the first sign has apparently come true, he will dash to the cooking fire to throw rat poison on the ground; after the third and final sign, he will run around town in wild panic, thinking the end of the world has finally come to Border Watch. Once the related quest is completed, he will return to his usual schedule, although shaken in his faith. 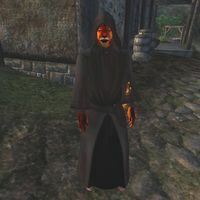 Ri'Bassa is the proud owner of one of only three black hoods in Cyrodiil, a valuable item for enchanters because of its weightlessness. Additionally, he wears a black robe and a pair of rough leather shoes. He's armed with a leveled two handed blade of the best possible quality and also carries two measures of rat poison and a few gold coins. Ri'Bassa also knows a leveled set of warlock spells. 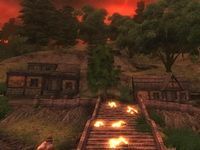 During the related quest, Sheogorath will tell you that he finds the town of Border Watch to be too peaceful and dull and suggests that you should help him make their lives more interesting. To do so, he will give you the task of making one of the town's many prophecies come true, namely the K'sharra Prophecy, saying, "Find their shaman and ask about the K'Sharra prophecy. You are to find a way to make the first two parts of the prophecy come true. I'll take care of the rest, because it's the most fun. Now, run along." "I am a traveling scholar." "Wonderful! I would be glad to tell you more. It has been told from our fathers, and our fathers' fathers, that our time in this place will come to an end. My great-great-great grandfather, K'Sharra, foretold of a time when we would receive three signs from the gods, signalling the end of the world." "You would mock our beliefs? Fool! When the three signs are upon us, you will learn!" No matter what option you chose above, you will then be able to ask Ri'Bassa about the three signs of the K'Sharra Prophecy. If his disposition toward you is less than 40, he will not provide you with any information and will say, "I will tell you nothing of the three signs. You are an unbeliever and a fool." After you get his disposition toward you to at least 60, he will begin to tell you about the three signs: "These are the signs as they were foretold. First, there is the Plague of Vermin. It is said our town will be overrun by disease carrying creatures. Rats, I would imagine. Horrible little things. I always keep a powerful rat poison around in case I see one of the little monsters." He will then continue, telling you about the second sign: "Next is the plague of Famine. It is foretold that our livestock will fall dead in their fields, with no apparent explanation." The next thing he says will vary depending on whether or not any of the sheep in town have been killed. If all the sheep are still alive, he will say, "We have but the six sheep in our pasture, and we make sure they are well-tended." However, if at least one sheep has been killed he will instead say, "We have had some livestock die recently, but not all of them, which is a relief." He will then pause, and you will have to ask him what the third sign is. He will reply by telling you that he will not reveal what it is to an outsider: "The Plague of Fear. I will not speak of this. Not to any outsider. I'll answer anything else I can. Is there something more? Perhaps you'd like to know more about Border Watch itself?" Should you follow up on Ri'Bassa's suggestion, he will provide you with a heartwarming description of Border Watch when asked about the town: "I'm glad you asked. I could go on all day about our little community. We are but a handful of Khajiit, as you can see. Many are the evenings we spend around the cooking fire, sharing stories of Elsweyr. The smell of our food travels for miles! If you'd like to stay, I'd suggest getting a room at the Border Watch Inn. We don't get many visitors, but S'thasa serves a fine ale. She also has the finest collection of cheeses in the Empire! Her prized cheese has such a powerful aroma, she keeps it sealed in a case!" "The end of all things has come! We're finished! All hope is gone!" While Ri'Bassa may have a very relaxed demeanor when you first enter town, this will soon disappear as the signs of the K'Sharra Prophecy come true. After the smell of the Olroy cheese in the cooking fire attracts a swarm of rats, Ri'Bassa will immediately run to the area to spread some rat poison. If you stop him while he is doing this, he will only say, "No time to talk! I have to get rid of these rats!" He will then immediately exit conversation with you. After he has finished placing rat poison around the cooking fire, he will approach you and worriedly say, "You've seen it! You've seen the first sign! Perhaps this is the beginning of the K'Sharra!" You can then ask him about the K'Sharra Prophecy, which will cause him to urge you to leave town: "It has come! We're doomed! Doomed! Run while you can, stranger. Get out!" He will become even more frantic once the town's livestock have been killed, believing that the third sign of the K'Sharra Prophecy will be coming soon. He will hint at what this is should you talk to him, as he will yell, "The livestock are dead! Dead! The second sign! Look to the skies! Look to the skies!" You will then be forced to exit conversation. Once the K'Sharra Prophecy has been completed, he will, like all the other residents of Border Watch, run around the town in a panic. If you talk to him, he will only say, "The end of all things has come! We're finished! All hope is gone!" He will then end his conversation with you and continue running around until the quest has been completed. If you want his rare hood, you'll have to steal it from his corpse, reverse-pickpocket a zero-weight armor/enchanted headpiece onto him and return later to steal the hood (although the hood does not actually count as a stolen item), or use the Skull of Corruption Glitch to take one from his clone after you have completed Sheogorath's quest. Esta página foi modificada pela última vez à(s) 02h40min de 9 de julho de 2015.